Frequently Asked Questions – FIMCO Manufacturing Inc. Which type of PVC cement do you recommend? Most types of PVC cement will work fine though we recommend standard clear PVC cement. We recommend against using the fast-setting blue cement as it’s extremely aggressive and can damage the valve housing. For more on the usage of PVC cement in the indexing valve click here. 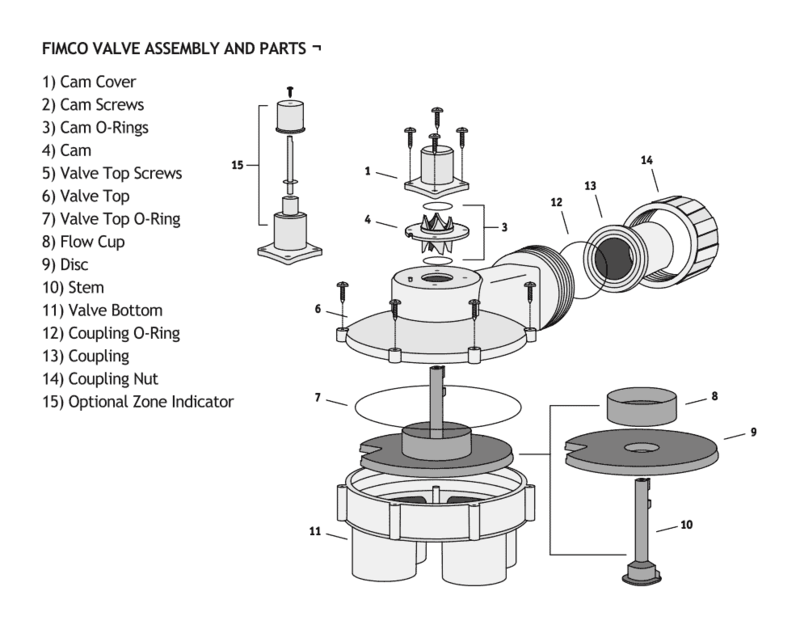 How do I configure the valve for my specific number of zones? A four-outlet valve can run 2, 3, or 4 zones. 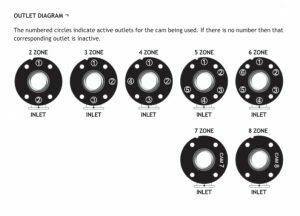 A six-outlet valve can run 2, 3, 4, 5, or 6 zones but in order to run 3 or 4 outlets on a 6-outlet valve a special white cam is used. The eight-outlet valve (1in. only) can run 2, 4, 7, or 8 zones. To purchase a specific cam for your unit click here. How do I select which zones will be active? This is a tougher one as you really don’t select the active zones, rather the cam does. If you run three zones on a four-outlet valve, outlet four will be skipped. Consult the instruction booklet here for more information regarding cam configuration and active zones. How long should I wait after gluing before I test my indexing valve? Make sure to let the PVC cement set for at least TWO HOURS before operating or testing the indexing valve. Failure to give adequate setting time could cause your pipes to blow out and would require the purchase of a new valve bottom. Do you have any tips for installation? 1. Flush all lines to the valve to clear debris before installing valve. 2. Make sure that you place your coupling nut on your coupling before gluing. 3. On plastic or fiberfill valves apply standard clear PVC cement (do NOT use blue fast-setting glue) ONLY to the outside of the pipe (not in the valve outlets) and then insert the pipe into the outlet and hold for approximately 10 to 15 seconds to keep pipe from sliding back out again. For a better hold: Turn the pipe approximately 1/4 turn after the pipe is pushed into the outlet all of the way. Do NOT hold the valve upside down while applying the cement as it may get inside the unit and hinder movement. Make sure to let the cement set for at least TWO HOURS before operating or testing the valve. 5. The valve should be installed higher than the sprinklers and lines. 6. On unused outlet or outlets, glue an 8 to 10 inch pipe into the inactive outlet and cap it off. You may add zones to the system at a later date by connecting the pipe or pipes to the system and changing the cam. 7. Make sure the proper cam is being used and the two o-rings are in place. Let us know how we can help. We will get back to you as soon as we can.